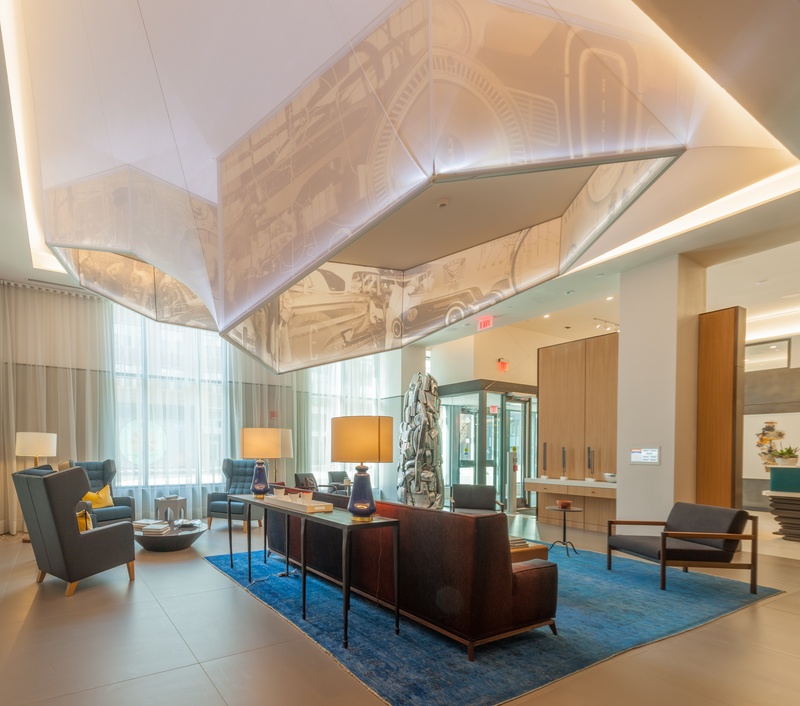 A custom built fabric structure luminaire designed by Planeta Design Group with Transformit for the Montaje Apartments, Somerville, Massachusetts was named a finalist by CODAworx for the 2018 CODAawards. 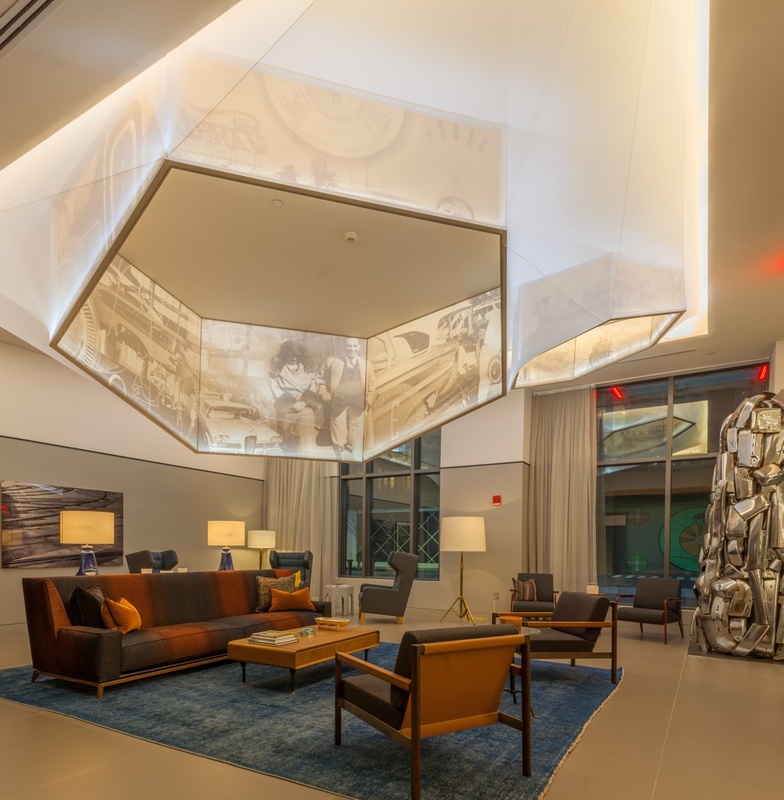 The lighting fixture features aluminum extrusion frames, stretch mesh, and stretch fabric printed with images from the site's era as an assembly plant for Ford Motor Company. Transformit’s Creative Accounts Director, Tom Newhall, and Cory Gans, Senior Designer at Planeta Design Group, met several years ago at ABX Boston. Gans shared with Newhall an idea for a luminaire he was designing for an apartment building under construction. 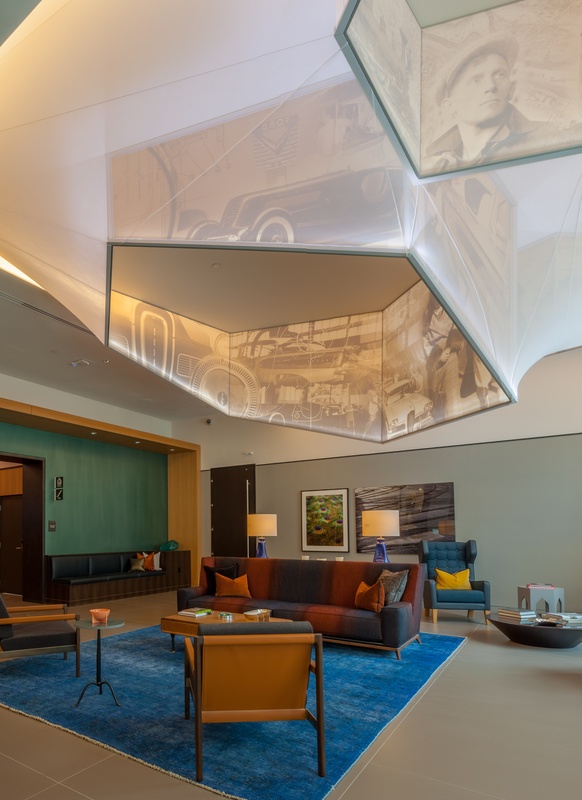 Gans envisioned a luminaire using fabric to create a semi-transparent, light and airy feeling, and historical photographs from the site’s days as an assembly plant for the Ford Motor Company to create a site-specific art installation. Newhall, who has a degree in industrial design, immediately recognized the possibilities and fabrication options for developing Gans’ idea, and thus began a conversation that led to the design and fabrication of this beautiful luminaire. 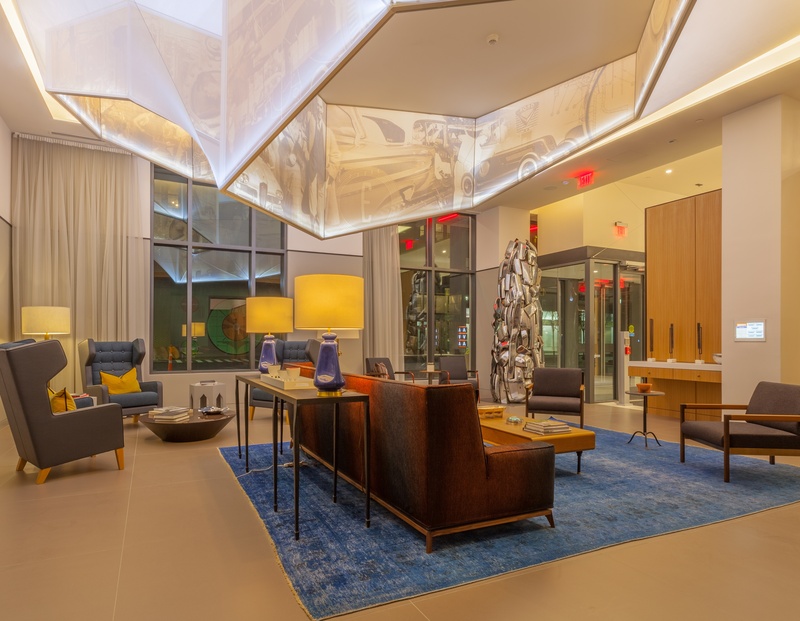 The lighting fixture would be installed in the lobby of the Montaje Apartments, a new construction project located at Assembly Square in Somerville, Massachusetts. The light fixture needed to fit in a 20’ x 25’ coffer. With Gans and his colleagues at Planeta leading the design process, and Transformit designers Jonathan Crowe and Denise Laverriere focused on the engineering, textile, and fabrication elements, the two creative shops collaborated to design a luminaire comprised of three hexagons of varying size, orientation, and elevation suspended from the ceiling. The sidewalls of each hexagon are historical photographs of the automobile assembly line, buildings, people, and fashion from the Edsel Ford era printed on semi-transparent stretch fabric panels. A single white stretch mesh is secured around the entire soffit perimeter and the lower exterior of the three hexagons, leaving the interiors of the hexagons open to the lobby below. Strategically placed seams in the fabric in combination with taut aircraft cables between the hexagons give the surface of the mesh a faceted look. To our knowledge, nothing like this had been built before, so Crowe began by prototyping frames with various construction materials, eventually choosing a narrow aluminum extrusion for the frames. To achieve the varied angles of the hexagons, which was not possible with standard hardware, we designed and milled custom joinery in our machine shop. 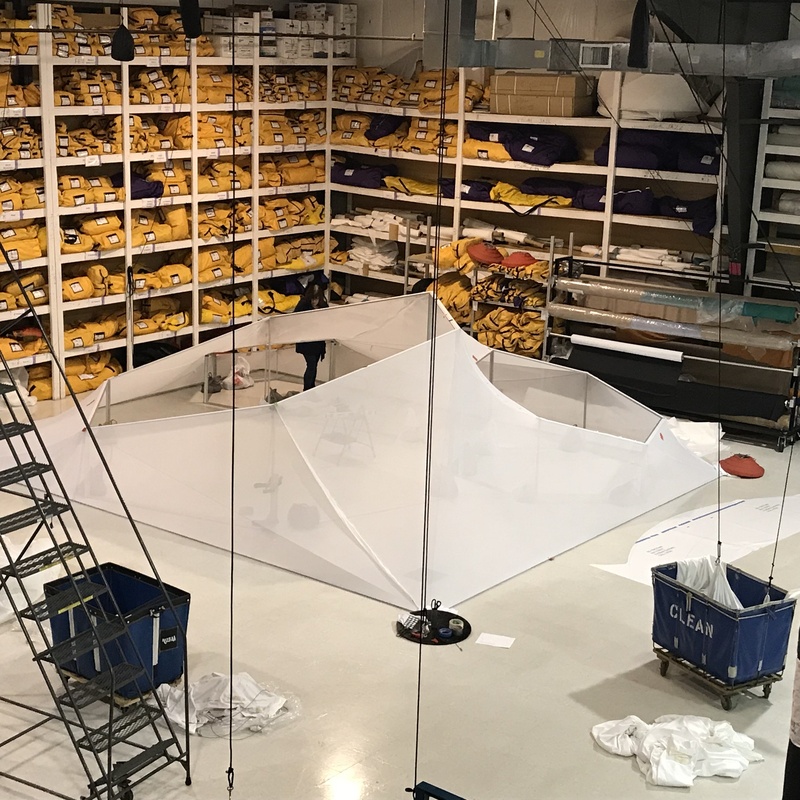 And to affix the stretch fabric graphic panels and the white mesh, we employed our patented “FasTen” system, which enabled us to secure the fabric to channels in the frames. Working with 3D models and a lighting program, we were able to simulate how the chosen approach would look in the space. Both Transformit and Planeta being satisfied with those early results, we built a prototype using the smallest hexagon shape at full scale. To test how the graphics, designed by Seattle-based firm Foreseer, would look as seen from the front and reverse faces of the stretch fabric, we had graphics printed using different saturation levels. We also looked to see how the graphics appeared with the light wash back-lit or on the front face, and when viewed directly or through the white mesh. By mocking up all these various options, we could see that the historical “old” look Gans sought for the photographs was best achieved with the images printed and illuminated on the exterior face, meaning the image seen inside the hexagonal column is viewed indirectly, through the fabric. Additionally, we adjusted the saturation level such that the exterior faces, when viewed through the white mesh, had a light value comparable to the interior faces. Fitting the 20’ x 25’ tensioned mesh neatly and smoothly around the three angled hexagons required a hands-on touch. We printed and laid out a full-scale ceiling plan on our shop floor, upon which we assembled the entire piece bottom-side up, positioning the hexagons in their precise locations on the “ceiling." Transformit’s Laverriere then hand-cut and fit the mesh to the perimeter and hexagon frames, editing the material much like a tailor fitting a bespoke dress or suit. Laverriere was on hand for the fixture’s installation as well—which, keep in mind, was now flipped bottom-side down and installed overhead in the ceiling coffer—making final adjustments in the fabric to maintain its smooth and precise tailored finish. The internationally acclaimed CODAawards celebrate the projects that most successfully integrate commissioned art into interior, architectural, or public spaces. The CODAawards program honors the individuals and the teams whose collective imaginations create the public and private spaces that inspire us every day. We loved working on this piece with Cory Gans and Planeta Design Group, and we couldn’t be happier with how well it works in its space. We are thrilled that CODAworx has included this luminaire among the beautiful commissioned art projects named as finalists for the 2018 CODAawards. Update: Montaje Luminaire was a Residential category award winner in the 2018 CODAawards.